In the previous column, we examined some of the familiar reverse types associated with Roman military life and the vows undertaken by emperors. 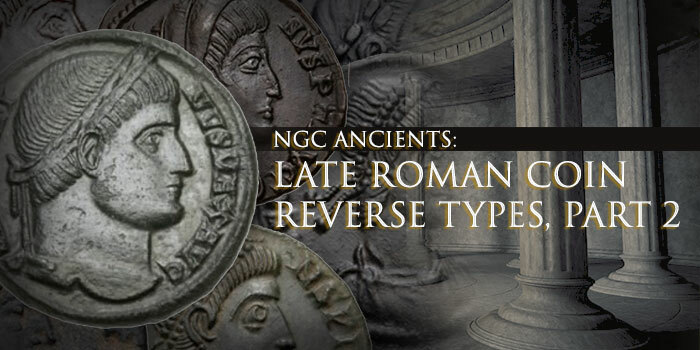 In this second (and final) part, we’ll describe a variety of other reverse types from the Late Roman Empire, once again focusing on billon and copper coins produced from about A.D. 268 through 476. We’ll start with two iconic types issued c.330 to 340 in celebration of Rome and Constantinople, the twin capitals of the Roman Empire. Since these pieces (below) do not portray an emperor or a member of the royal family, they are categorized as ‘anonymous’ issues. 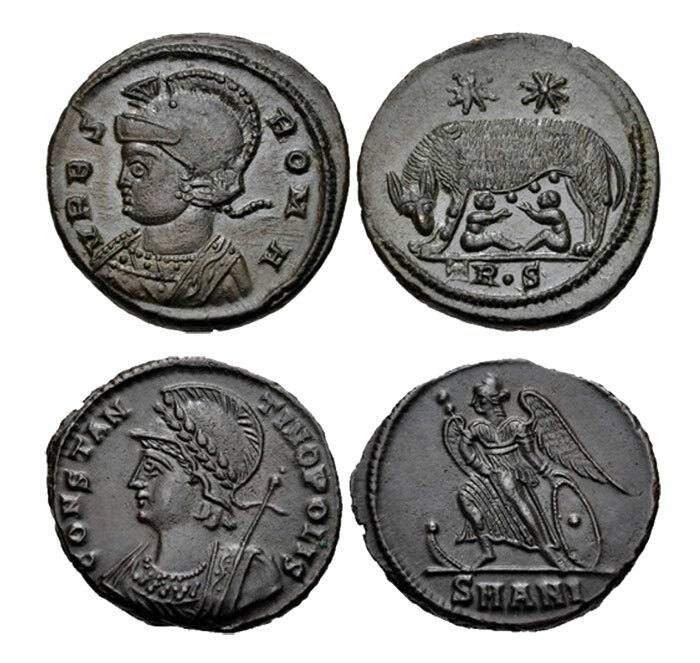 The first coin honors Rome by portraying the eponymous state god Roma and showing the twins Romulus and Remus being suckled by the she-wolf. This design relates one of the most familiar foundation myths of ancient Rome. The second honors Constantinople with a portrait of that eponymous state god and a depiction of Victory stepping onto a ship’s prow. This alludes to the naval victory by which the forces of Constantine I ‘the Great’ (307-337) captured the city of Byzantium (which he later selected as the site for his new capital, renaming it Constantinople in his own honor). The Romans were talented engineers and builders, and they often pictured temples and other structures on their coins. Above are two examples showing the temple of Roma. The first is a billon aurelianianus of Probus (276-282), the second a billon nummus of Constantine I. Above are four billon AE3’s with one of the most recognizable reverse types of the Late Roman Empire, a “campagate”. It represented the entryway of a fortification, which must have been a source of comfort in an era when frontier defense was a prime concern. The first three are of Constantine I and the last is of Constantine II (as Caesar, 316-337). Three further “campgate” coins are shown above. The first two, of Constantine I, depict a campgate with open doors. The first of these is a silver argenteus he issued while Caesar (306-309) and the next is a billon AE3 he issued as Augustus. Finally, there is a small and comparatively primitive AE4 of the Eastern Roman Emperor Arcadius (383-408). Another fortification type was popularized during the late third and early fourth centuries by the emperor Diocletian (284-305). It shows nearly a bird’s-eye view of walls that would enclose a city or a military camp.All three of the coins above are silver argentei showing four rulers (the ‘Tetrarchs’) sacrificing at a tripod before the entry gate. 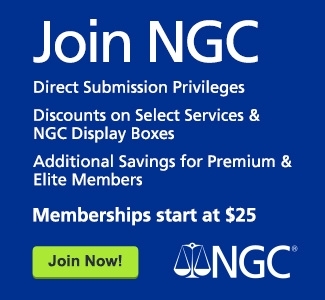 The first two were struck for Diocletian, and the last for Galerius (as Caesar, 293-305). 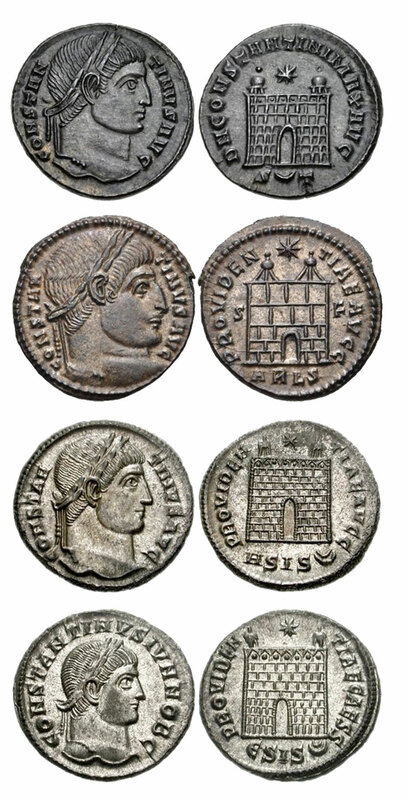 The two anonymous billon coins above were struck at Constantinople in about 330 and bear one of the most unusual architectural types on Late Roman coins. It is generally believed these reverses show a bridge over rushing water, but, if so, there is little certainty about which bridge is represented. It may be a specific reference to the then-famous Milvian Bridge in Rome, or a generic reference to a bridge over the Danube (where Constantine I had important campaigns and massive defense construction projects). 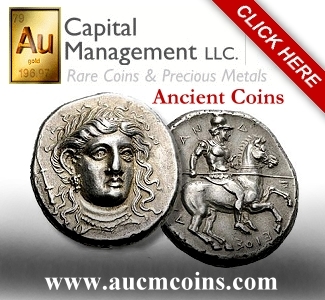 The Romans frequently honored their deceased rulers on coins. Sometimes the designs of these coins show architectural works. Above are two billon nummi showing memorial buildings. 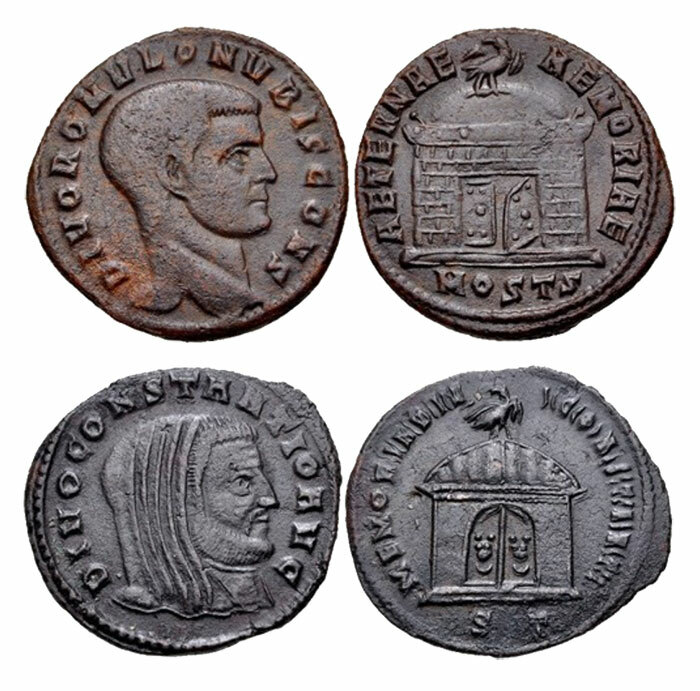 The first was issued for Romulus, son of the rebel Maxentius (306-312), and shows a sepulcher with one door ajar; the second was issued for Constantius I (305-306), father of Constantine I, and shows a domed shrine with its doors closed. 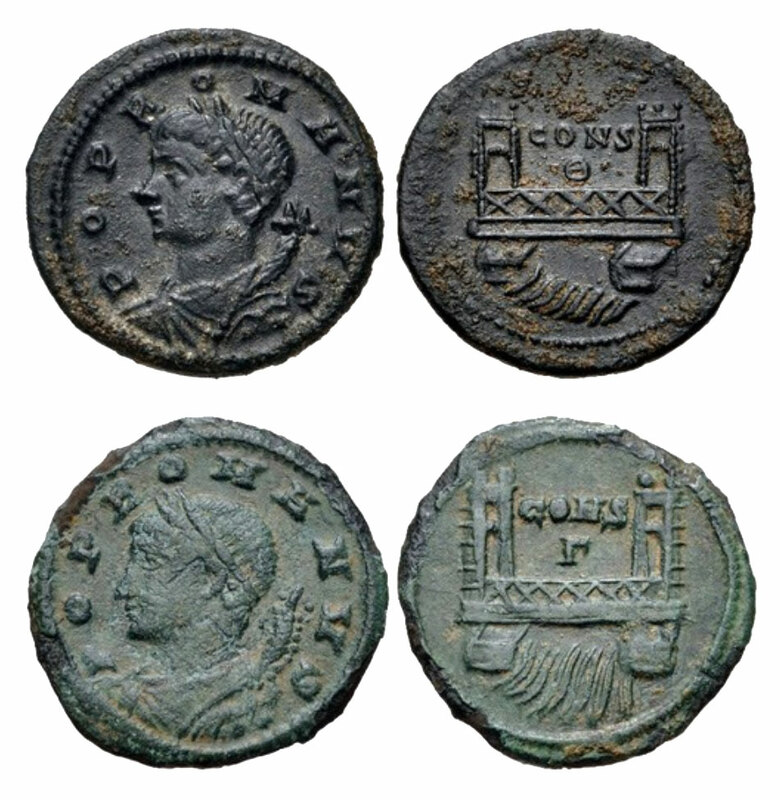 Altars also occur on Late Roman coins dedicated to deceased emperors. Typically, they are topped with flames. 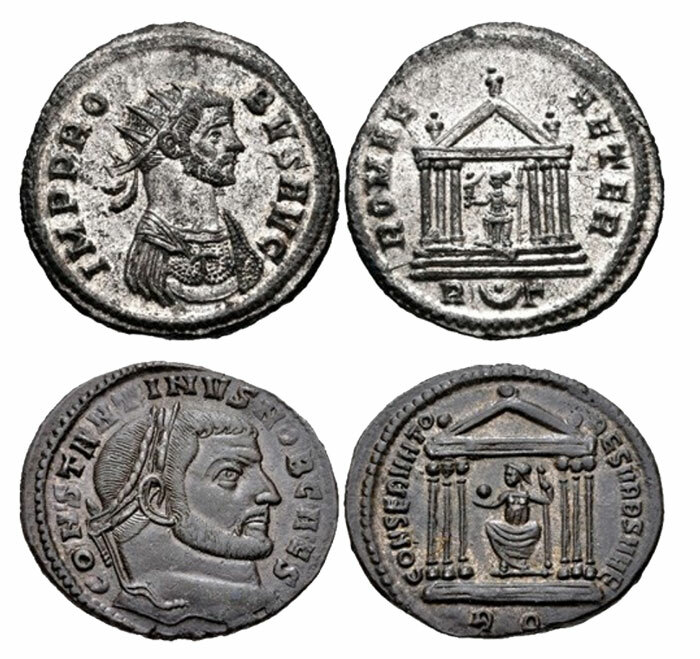 Above are three such coins: a double-denarius for Claudius II (268-270), a nummus for Galerius (on which the altar is decorated with a garland and an eagle) and a nummus for Constantius I (with its garlanded altar flanked by eagles).Ships were important elements in many of Rome’s military ventures. 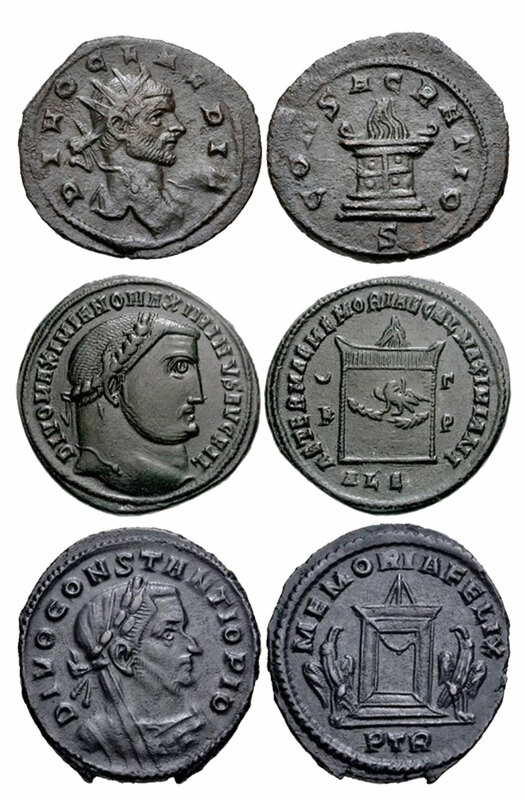 Five Late Roman coins depicting galleys are shown below. First is a billon AE3 of Constantine I showing Victory on a war galley. 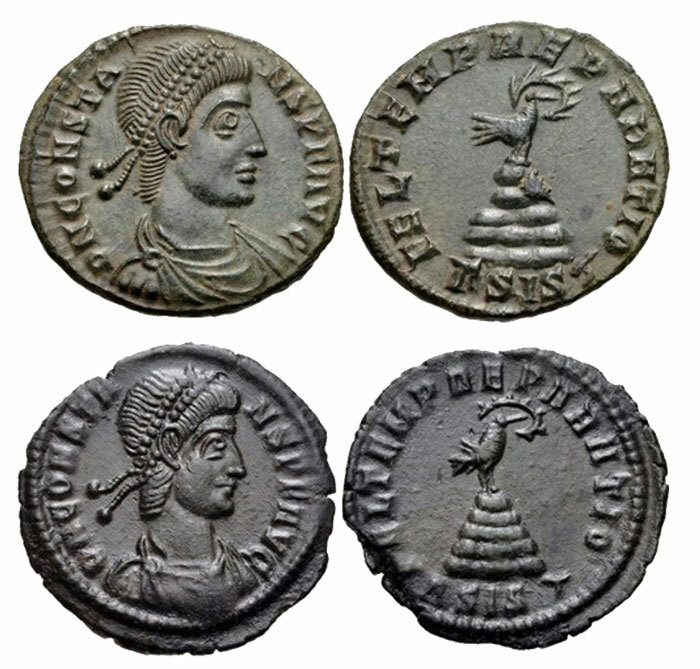 Next, are three billon centenionali of Constantius II (337-361) showing the emperor holding a military standard and a phoenix in a galley steered by Victory. Last is an AE2 of the Eastern Roman Emperor Theodosius I (379-395) with a similar reverse design. The phoenix – the mythical bird held by the emperor on the three centenionali previously shown – stands on a rocky mound on the two half-centenionali above. Both were issued by Constans II (337-350).From the mid-third century onward, Christianity became an increasingly important religion in the Roman Empire, and eventually became the official religion of state. 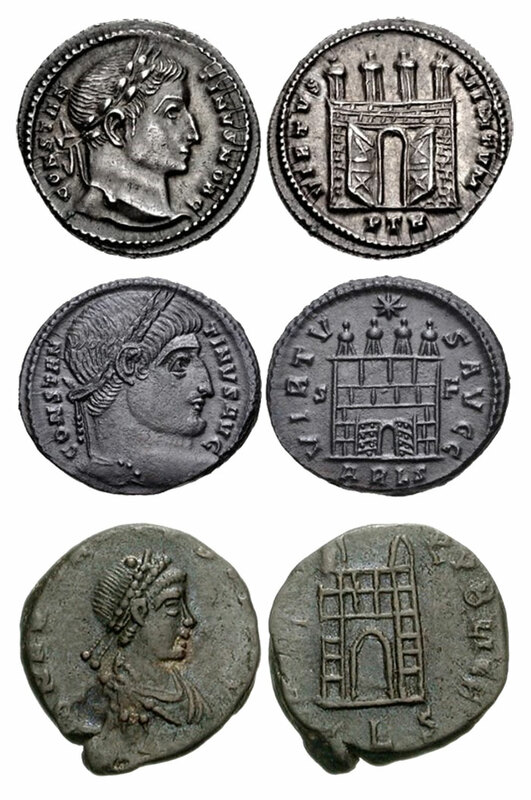 Below is a selection of Late Roman coins bearing designs or symbols associated with Christianity. We’ll start with an AE4 of Arcadius with a simple and direct design: a cross within a wreath.Below are three coins with the Christogram, a monogram comprised of a “Chi” and a “Rho”, the first two letters of Christ’s name in the Greek alphabet. 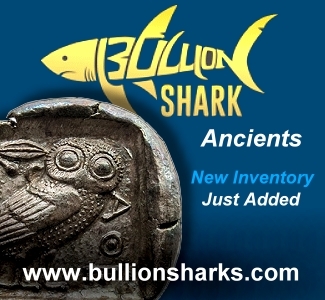 It became symbolic of Christ and was widely employed on coins and a host of other objects. 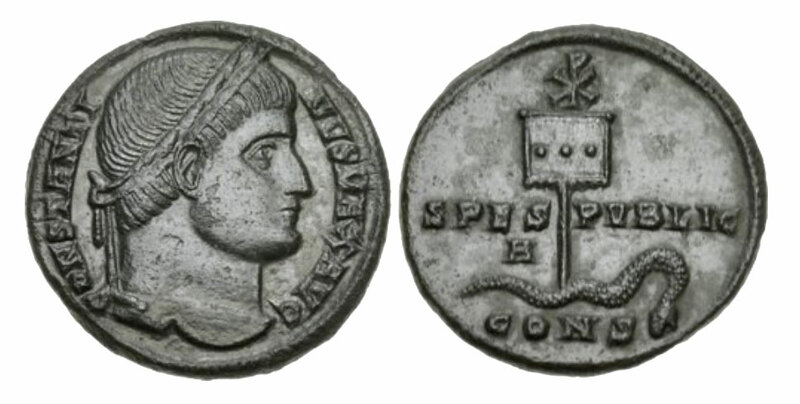 First is an AE3/4 of Constantine II (as Caesar) with two soldiers flanking a labarum – a military standard bearing a Chi-Rho. 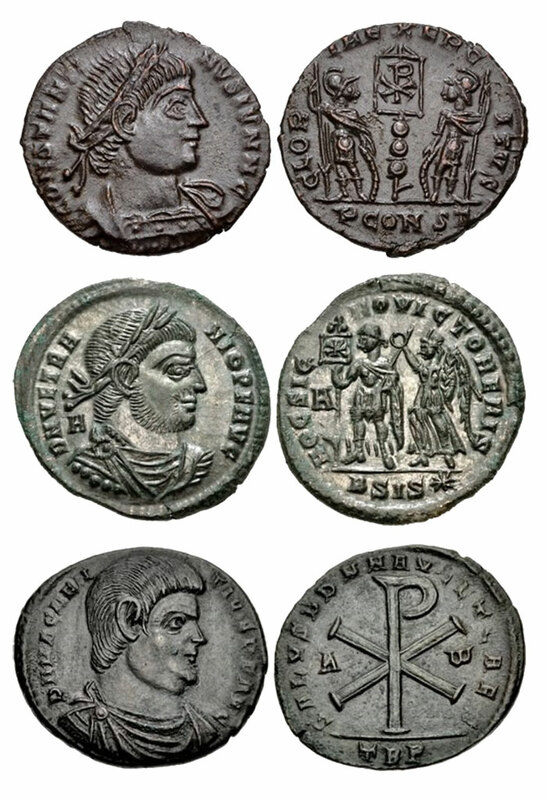 Next is a centenionalis of Vetranio (350) showing Victory crowning the emperor, who holds a labarum; the design is accompanied by the inscription HOC SIGNO VICTOR ERIS (“in this sign you will conquer”), a reference to Constantine’s historic defeat of Maxentius in 312 at the Battle of the Milvian Bridge. Last is a double-centenionalis of the rebel Magnentius (350-353), which shows the Christogram flanked by an “Alpha” and an “Omega”, respectively the first and last letters of the Greek alphabet (a reference to Christ and God spanning eternity). The coin above offers a further example of Christian symbolism on Late Roman coins. It is a very rare AE3 of Rome’s first Christian emperor, Constantine I, showing a serpent pierced by a military standard topped with a Christogram. This composition generally is thought to represent the triumph of Christianity (as embodied by Constantine, his family, and the Roman state) over Satan. 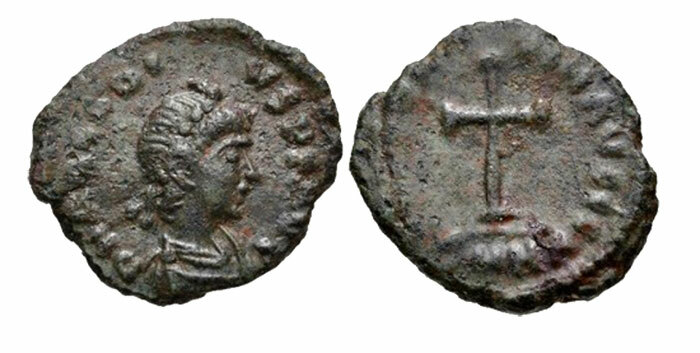 Similarly interesting – though far more common – is the memorial AE4, shown above, which was issued for Constantine I soon after his death in 337. The obverse is essentially a pagan type since it shows Constantine’s veiled head and, with the DV at the start of the inscription, makes reference to him as being consecrated (divo). By contrast, the reverse is decidedly Christian. It shows Constantine ascending heavenward in a chariot, nearing the Hand of God. This unique design was described even in ancient times by Bishop Eusebius as showing Constantine’s approach to heaven. The composition may have been inspired by the Biblical account of Elijah ascending to heaven in a chariot of horses of fire. We’ll end the survey with a distinct and separate category of Late Roman coin designs – imperial monograms. 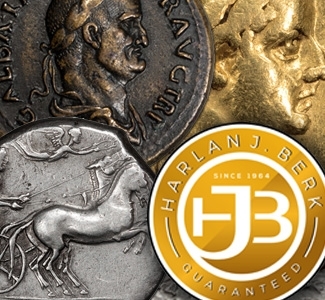 Below is a selection of monograms on coins, each representing the names of emperors with a design comprised of letters drawn from their names. 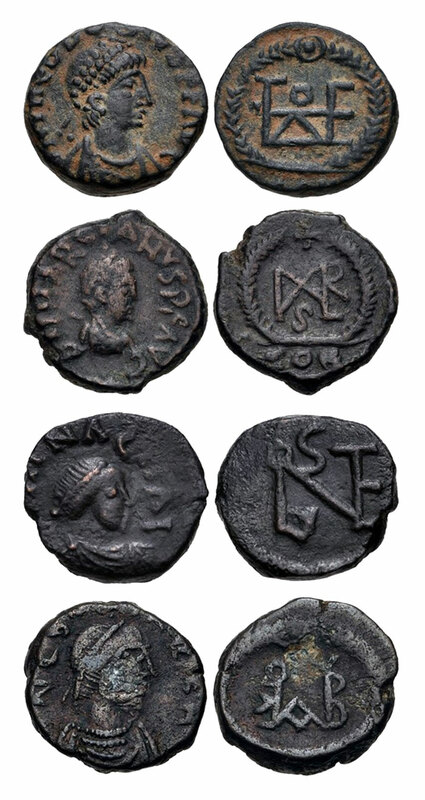 All of the monograms shown here occur on small copper (or leaded-copper) coins usually described as AE4’s. 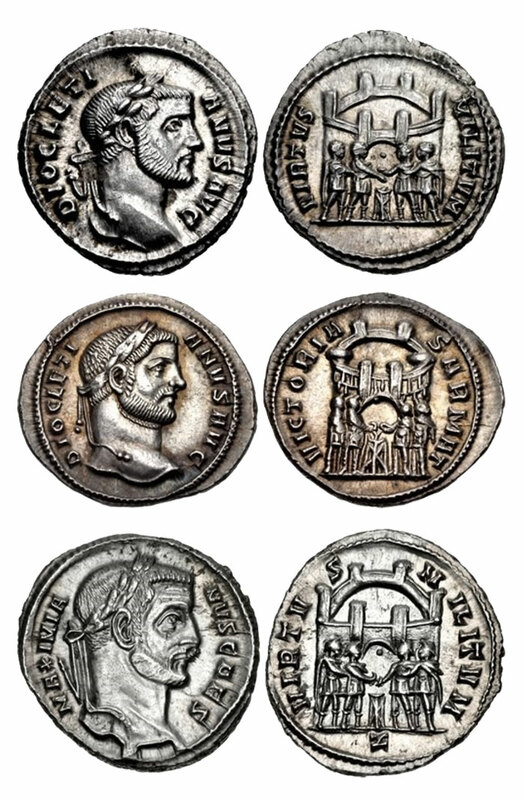 In order, they are: Theodosius II (402-450), Marcian (450-457), Leo I (457-474) and Basiliscus (475-476).